This is a ginormous skate park of endless banks and bowls. Most of the banks are 4 to 5 feet, and the major part of the park has a side by side run that is separated by a spine. There are also lots of ledges, handrails, blocks, and an octagon volcano. There is a beginners area right next to the parking lot. 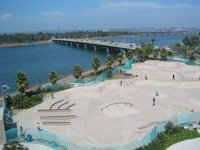 Better yet, San Diego just elimated the park supervisors and the requirements for pads and helmets in March of 2009. The park is also now FREE. Only complaint is the bowls are too flat and the concrete is getting old.